Quantities of Indian painted textiles were imported into Europe by the Dutch, English and French East India Companies during the 17th century. They provided a direct incentive for the production of satisfactory substitutes at home, and this led to the development of European calico printing industries. 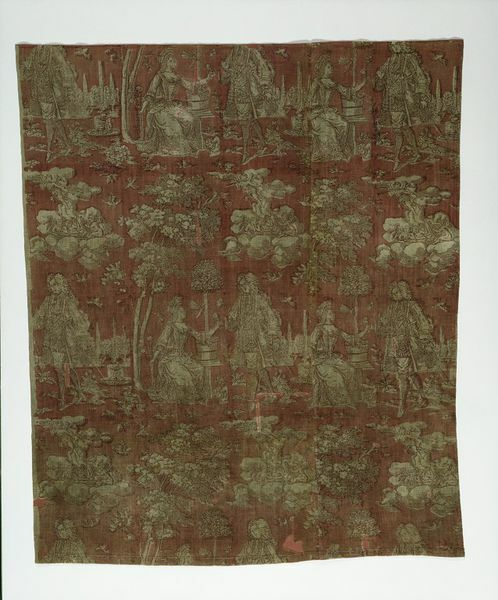 Printed calicoes were used for both furnishing and dress fabrics, this example being for furnishing. The couple are dressed in highly fashionable clothes of the 1690s. In 1676 William Sherwin of West Ham in London was granted a patent 'for a new way of printing broad callicoe'. It seems likely he was the first English manufacturer to print textiles using madder dyes and mordants (substances to fix the dyes) for the different shades required, as have been used here. In the 1690s a number of calico printers had workshops in East London, always near good sources of water, like the River Lea, quantities of water being necessary for different stages of the manufacturing process. Similar developments in textile printing to those in England were taking place in Europe, particularly The Netherlands, France, Germany and Switzerland, and it is difficult to determine the origin of European printed textiles of this date. This cotton was acquired by the Museum from an Icelandic source in the 1880s. Iceland was ruled by Denmark in the late 17th century, and Denmark had strong trade links with London, so an English origin is possible for it. 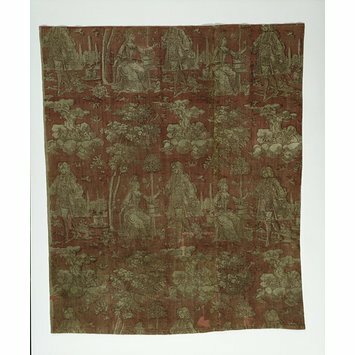 Printed cotton (calico); block printed cotton; rectangular piece of textile printed with a repeating scene of a fashionably dressed couple meeting in a garden. She is sitting between a tubbed fruit tree (lemon possibly) and a pot of roses. A small dog is at ther feet and she holds out a rose to the gentleman who is approaching her from her left. Above them, on a cloud, a band of winged cherubs are playing the harp, drums, tambourine and trumpet whilst looking on. The image is picked out in white against a red ground. The word 'calico' comes from the name of Calcutta, the Indian port from which cotton cloth was sent to Europe. Europeans produced printed calico as an alternative to painted Indian textiles. By the 1690s there were a number of calico-printing works in East London making dress and furnishing fabrics. The scale of this design suggests that it was suitable for bed hangings.